Eagle security solutions provide the design, installation and maintenance of CCTV systems for home and commercial premises in London and Home Counties. We provide a wide range of security cameras suitable for homes, shops, offices, warehouses and small businesses, including analogue, HD-TVI and IP cameras, fully installed at competitive prices. CCTV surveillance can provide a visible and effective deterrent against all types of crimes including burglary. Home CCTV system can enhance your security and allows you to keep an eye on your home from anywhere in the world via internet/smartphone. You will find our security camera systems are available for installation at prices that meet varying needs and budgets. We provide free site survey and written quotation as well as a fast-track CCTV installation for homes and businesses located in London. High definition transport video interface (HD-TVI) is a format which allows for high definition image transmission over coax or Cat 5 cable. It offers HD 1080p image at a very cost effective solution comparable to an IP system and provides a better image quality than the traditional analogue systems. 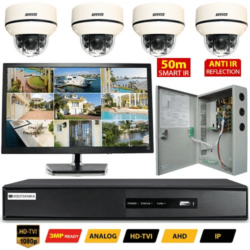 A range of high resolution and affordable CCTV cameras with up to 1000 TVL, hard-wired via coaxial or CAT 5 cable and connected to a good quality digital video recorder providing hard-disk storage and smart-phone connectivity. The security camera system comes with a digital video recorder incorporating time and date stamp, motion detection, hard drive, USB drive and/or DVD writer for image storage and backup. Our analogue DVR comes with H.264 video compression as standard and up to 960H resolution for recording, playback and display. Based in London, our CCTV installations are carried out by qualified installers and come with 12 months minimum parts and labour guarantee. Each system comes with an option for remote viewing over the internet and via smartphone, allowing home and business owners to monitor their premises from anywhere in the world. To comply with the Data Protection Act, CCTV systems in commercial premises and public areas must be registered with the Information Commissioner (UK) and warning signs should be displayed.